Our villa in Alcudia is available in 2002 for rent from April until October. It's a short walk from the wonderfully sought after white sand beaches . 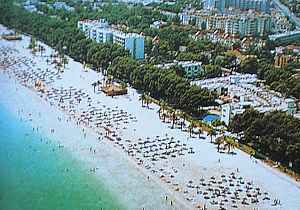 . .
Alcudia is situated on the East Coast of Mallorca next to Puerto de Pollensa, less than an hour from the airport in Palma. 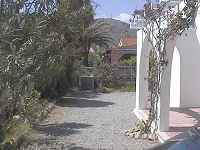 It is a three bedroom self-catering villa for rent which has all the facilities for and will comfortably sleep six people. It has a lounge are, fully equipped kitchen, a bathroom and a shower room. 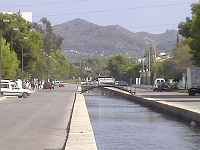 Over this winter the road on which we are is being improved with wider pavements and more attractive landscaping to the beautiful canal which gives this area the feeling of the Little Venice of Mallorca. The villa is in a residential area about a ten minute walk from both the Port of Alcudia and the 7 mile white sandy beach which makes this wonderful town one of the most sought after holiday destinations in Majorca. The beach is the equivalent of Juan les Pins in the South of France - but you often get much better weather here both earlier in the season and extending well into the Autumn. The webmaster has found swimming here comfortable even in late November. The water is shallow and perfect for both children and swimming. It is within easy access to many excellent restaurants and bars. The shopping in the Port of Alcudia covers all tastes, including designer boutiques and duty free gift shops. 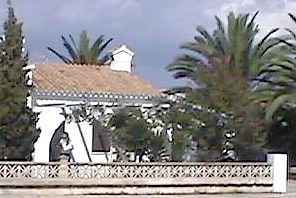 The old town of Alcudia is also within walking distance and you can follow the locals and tourists alike to the very popular outdoor market twice a week. This year we will be renting week to week from Tuesday to Tuesday (although other days may be possible) as this makes it easier to take advantage of the many good value flight offers to Mallorca commonly on offer. We ask 50 pounds per person, minium of 150 per week in all months other than July and August when the minimum will be 200 pounds per week. This is deliberately low as we require you to take your own sheets and towels etc and clean through before you leave . . . but above all, this is our own home-from-home and we ask you to look after it and leave it as you would like to find it. Please email alcudiahouse@antibes.co.uk for further details and availability. We also have tips on car hire and flights. 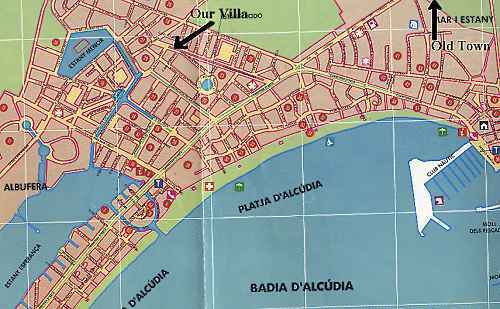 Puerto Alcudia lies at the northern end of the Bay of Alcudia's 11km sweep of curving white sand beach. This lovely old fishing village has restaurants, cafes, bars and shops lining the sea front and the tiny paved streets behind. "Shop till you drop" or meander around the marina, full of fishing boats and luxury yachts! For those who like history, the Roman forum of Pollentia, theatre and houses have been excavated. Sections of the medieval walls and several of the gates to the town still remain and behind them are narrow streets with some fine buildings. The nuseum is welll worth a visit. Should you decide to wander further afield Puerto Pollensa, Pollensa Old Town, Cala San Vincente and Formentor are just a few of the places all within easy reach of the Alcudia area. About 40 minutes away by car are the famous Caves of Drax which are one of the most famous in Europe with their underground lake. Whether you want relaxation, culture or activity - you'll find it here! For other apartment rental and villa holiday accommodation, please scroll to the links lower down the page.